[I]f you think that by hanging us you can stamp out the labor movement — the movement from which the downtrodden millions, the millions who toil and live in want and misery, the wage slaves, expect salvation — if this is your opinion, then hang us! Here you will tread upon a spark, but here, and there and behind you, and in front of you, and everywhere the flames will blaze up. It is a subterranean fire. You cannot put it out. The ground is on fire upon which you stand. These words would prove prophetic. The next May Day, and every May Day since, workers across the world took to the streets to contest the terms of capitalist prosperity and gesture toward a fundamentally different world — a world in which production is motivated not by profit, but by human need. Today, the power of the American labor movement is at a low. Many of its most important gains — including the right to the eight-hour day — have been dismantled by the anti-labor neoliberal consensus. But May Day still looms as a lasting legacy of the international movement for working-class liberation. Obviously, a great deal has changed since those explosive decades at the end of the nineteenth century. The defeats suffered by the American workers’ movement may seem so profound that it can be tempting to regard the militancy that once rattled tycoons and presidents alike as nothing more than a piece of history. But we don’t have to gaze so far into the past for inspiring examples of struggle. Far more recent May Days provide glimpses at the transformative potential of worker movements. Just ten years ago, in 2006, immigrant workers across the country stood up to restrictive immigration laws and abusive labor practices, organizing a massive movement of undocumented laborers that culminated in the so-called Great American Boycott (El Gran Paro Estadounidense). On May Day of that year, immigrant organizations and some labor unions came together to organize a one-day withdrawal of immigrant labor — dubbed “A Day Without Immigrants” — to demonstrate the essential role of immigrant workers in American industry. Protests began in March and continued for eight weeks. The numbers are staggering — 100,000 marchers in Chicago kicked off the wave of demonstrations, followed by half a million marchers in Los Angeles a few weeks later, and then a coordinated day of action on April 10, which saw demonstrations in 102 cities across the country, including a march of between 350,000 and 500,000 protesters in Dallas. 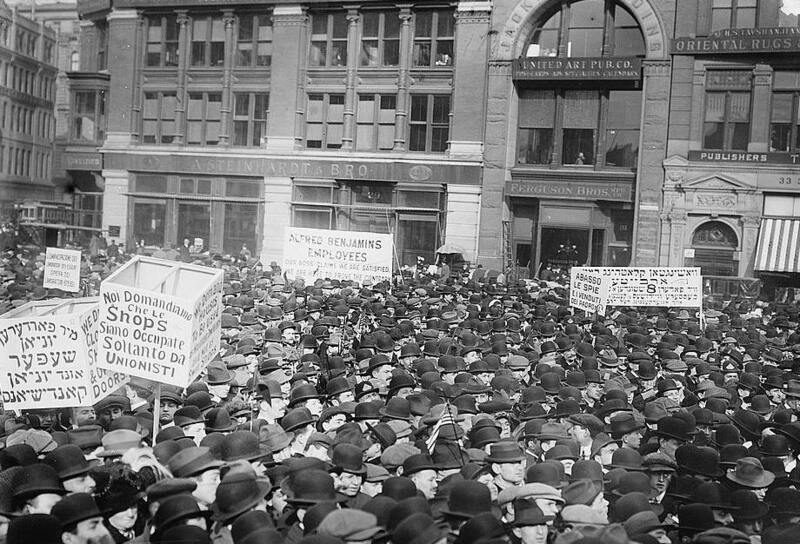 By May Day, the movement had gained momentum, winning popular support all over the United States and around the world. On May 1 of that year, more than a million took to the streets in Los Angeles, joined by 700,000 marchers in Chicago, 200,000 in New York, 70,000 in Milwaukee, and thousands more in cities across the country. In solidarity with Latin American immigrants in the United States, labor unions around the world celebrated “Nothing Gringo Day,” a one-day boycott of all American products. Ever since, May Day has been recognized as a day of solidarity with undocumented immigrants — a fitting reminder of May Day’s origins in a movement that saw native-born and immigrant workers standing together to defend their common interests. And this year, May Day presents us with more opportunities to mobilize support around an American labor movement showing signs of revitalization. This May Day, workers and activists across the country will stand in solidarity with the almost forty thousand striking Verizon workers, whose intransigent managers have thus far refused to bargain with the union in good faith. This May Day we follow in the footsteps of generations of labor radicals. These radicals saw in capitalism the horrors of an unjust economy, but dared to dream of something different — a reimagined economy in which the fruits of prosperity could be shared equally, among all people, in a just and democratic society. Despite the setbacks of the labor movement — at home and worldwide — that dream is still living. The struggle continues. Happy May Day. Take to the streets.